It’s book club time again. This is the fourth year I’ve lead the book club and I’m excited about the upcoming year of books and discussion. With my kids getting older, I’ve upped the age of the book club and the length of books we read. Que trump…. introducing, “Mommy, Daddy and Tween Book Club.” We’ll still continue to meet and be sponsored by the George Washington Carver Museum in Austin, Texas. Preteens also known as ‘tweens are the target age, eight to twelve years old (ish). 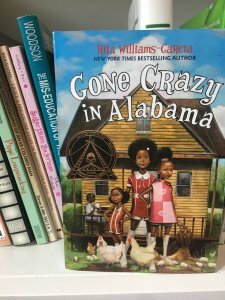 Our first book is “Gone Crazy in Alabama by Rita Williams-Garcia. Gone Crazy in Alabama is the third book in a series about three sisters. It can stand alone and be read out of order for new readers. 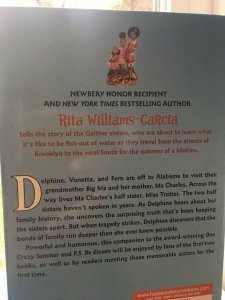 Mrs. Williams-Garcia gives just enough backstory from the previous books to help new readers appreciate the situations and decisions made by the Gaither sisters. In the summer of 1969, the sisters visit Big Ma (their father’s mother) and her eighty-two-year-old mother, Ma Charles in Alabama. There’s sibling fighting and reconciling with the young Gaither sisters and an old family feud between the elder Ma Charles and her sister Mrs. Trotter from across the river. I love the dynamics and the voice of 1969. It’s just a hair before my time, but I can identify with the characters and movements. The storytelling introduces my eight and eleven-year-old to the settings and backdrop of the American South in a way that I hadn’t been able to voice. The pride and love of the sisters and their family members and the contrast of interactions with American Blacks and Whites in an era just opening up to Civil Rights moves the conversation further when children read about Martin Luther King, Rosa Parks, President Kennedy, The Black Panthers, or the KKK. The Carver Museum sent out the book selection a little over a month via flyers and their monthly newsletter. I share the flyer and pictures on my personal and Tangled Press business Facebook and Instagram pages. We start the year with me picking the first book and then subsequent months I present the tweens and parents with two choices of books. The ballots have the two books and a brief summary including page length and targeted age. I think I’ll also start including audio length. Busy schedules often dictate audiobooks in my house. Only the children’s vote determines our book for the following month. I keep a poker face when they’re voting, and sometimes I have fingers crossed behind my back for the book they chose. I’m planning to play five minutes of the audio version at the beginning of this session. The narrator makes Gone Crazy in Alabama come to life. Between the cover illustration and the girl’s voices, you’ll feel like a fourth sister or at least a cousin watching the action. Anyway, I’ll play a bit of the book for all to hear and then we’ll start discussing the story. Looked for an update on which discussion questions went over well and how they were answered.